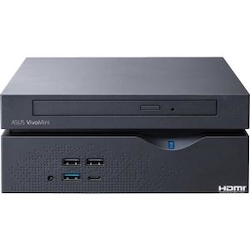 The ASUS VivoMini VC66 is a high-performance mini PC with a versatile modular design and full connectivity.The VC66 takes processor-intensive tasks in stride, thanks to its desktop-grade 7th Generation Intel Core (Kaby Lake) processor and DDR4 memory. There's 4K UHD display support, and all-around connectivity with several video output ports for compatibility with various displays.The VC66 is available in two configurations: It can be specified with one M.2 SSD with two 2.5-inch HDDs or SSDs, or with one M.2 SSD and one HDD or SSD and a 2.5-inch optical disc drive. This flexibility means you can use the VC66 as a file server, a media editing platform, or simply as a mini PC for daily multitasking and entertainment.